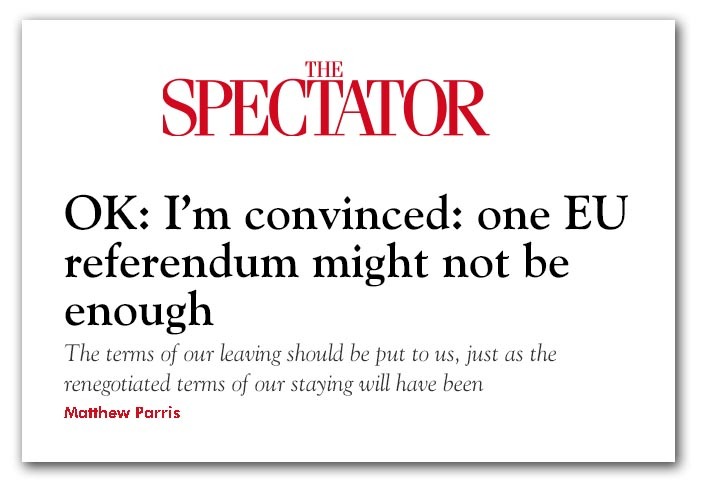 The Second Cummings is today featured in the Spectator in a piece written by Matthew Parris on a second referendum, held to agree the Article 50 negotiation. Perhaps getting his "brainchild" noticed, though, isn't a great feat when his wife, Mary Wakefield, is commissioning editor of the Spectator, something that has been rather helpful to his career in the past. And it is somewhat evident that the Spectator/Telegraph nexus is at work, helped no doubt by Cummings's business partner, Matthew Elliott, having for his brother-in-law Alistair Heath, deputy editor of the Daily Telegraph. This undoubtedly explains that we get a simultaneous exposition in that newspaper, written by James Kirkup. In its original inception, the idea of a referendum on the outcome of the Article 50 negotiations is not so far-fetched. The possibility has been incorporated in Flexcit from the very start. Specifically, it came in the context of us having a detailed exit plan, the idea being to keep the government honest. Effectively, within the first referendum, there would be implied consent to the exit plan floated by the official "leave" group. We would then expect the government to make this the basis of its Art 50 negotiations, with the threat of voting "no" in the second referendum if the government deviated substantially from the plan. However, this is not what Cummings has in mind. He lifted the idea from Flexcit but is using it as a means of avoiding having any exit plan at all. His "Vote Leave" group is so divided within itself that it is not able to agree a single plan. The only way to keep them together it is keep it vague - the more definite he is, the more sponsors Elliott loses. Yet Cummings's own focus groups have stressed the need for reassurance, that leaving the EU must be risk-free. This, in itself, suggests that we must produce a coherent and credible exit plan – the very thing "Vote Leave" cannot do. In order to square the circle, the man described as a "mad genius" has decided to opt out of plan-making altogether, declaring that this should be left to the government of the day. We would then have a referendum on the government's exit plan, and vote "no" if we don't like it. What Cummings hasn't worked out, though, is what happens next. In the first instance, there is no plan until it has been agreed by the European Council and the Parliament. Thus, the government would be bringing us something agreed at EU level. But, if we say "no", there is no provision for reopening the negotiations. Once agreement has been reached, that – as far as the EU is concerned – is the end of it. If on the other hand, the government took the provisional plan (without EU agreement) to the country, again we would have problems. We assume it will have taken the best part of two years to negotiate (it would be a miracle if it took less), in which event a "no" vote will mean that the government will have to renegotiate. But an extension of time requires unanimous agreement. And what if the European Council does not agree? What Cummings wanted out of all this was to "de-risk" the first referendum. It wouldn't be the final word. We could always have another bite at the cherry. But what this actually does is add additional elements of uncertainty. Not least, because of the potentially catastrophic consequences of a "no" vote, the government might exploit the situation, and use the Art 50 negotiations to come up with an agreement little different to full membership, or the associate membership that might otherwise have been on offer (which could also come with the option of a second referendum). At the time Cummings came up with his "brilliant" idea, though, he had no idea of how Article 50 worked (his grasp to this day is probably still slight). He simply wanted to justify his group's inability to produce a plan, so this became his own cunning plan as a way of getting everybody off the hook. Aware of what he was trying to do, I warned him of the dangers but – as with his idea of fronting the campaign on the costs of EU membership - he chose to ignore my advice. But, as it stands, it remains a particularly stupid idea. Exploiting family contacts to get it into the legacy media doesn't make it any better.